oktober 2014 | 360 blz. 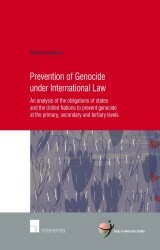 This book studies the pivotal obligation to prevent genocide under international law and more particularly the extent of that obligation under the Genocide Convention and customary international law. The author puts forward a distinction between primary, secondary and tertiary levels of prevention.